Brilliant filly Sunlight has shone brightest in the Coolmore Stud Stakes at Flemington, upstaging a number of high-profile colts in the Group One sprint at Flemington. The only filly in Saturday’s $1 million 1200m race for three-year-olds, Sunlight displayed speed and courage under Luke Currie to withstand a serious challenge over the final 200m. After racing on the pace, just off leader Written By, Sunlight ($5.50) hit the front and the held off Zousain ($3.40) by a half-neck. Zousain’s Chris Waller-trained stablemate Lean Mean Machine ($10) was another length away third with Written By finishing fourth. The fighting win by the Tony McEvoy-trained filly was also a triumph for Widden Stud which stands young stallion Zoustar who sired the first three placegetters. 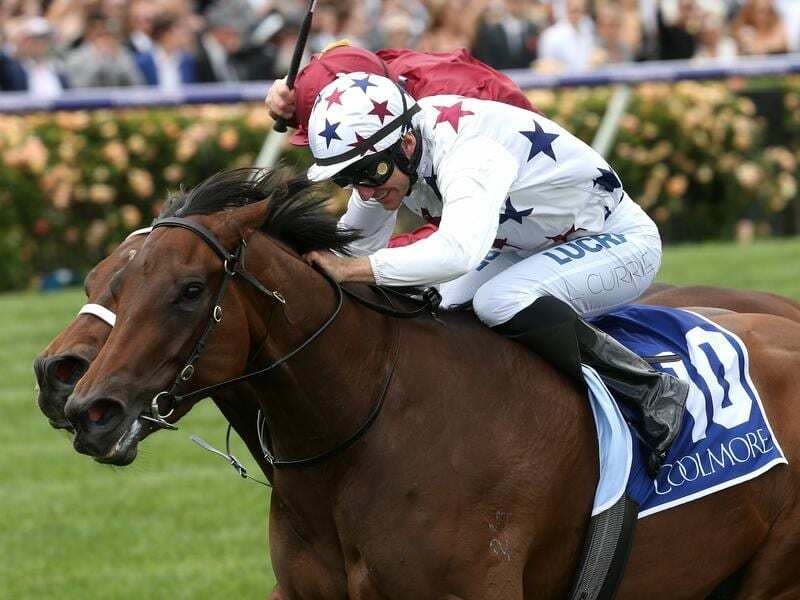 Zoustar won the Coolmore in 2013 while his sire Northern Metoer and grandsire Encosta de Lago are also on the honour roll as winners of the race. “It was a big call to take these colts on with this filly,” McEvoy said. “I’ve got such faith in her and she was there for the fight today. Those colts had their chance to get her. McEvoy decided to run last season’s Magic Millions Classic winner in the Coolmore after the filly was a luckless seventh in the Group One Manikato Stakes against older horses at Moonee Valley eight days earlier. The Coolmore (1200m) has developed into an important stallion-making race, with the potential to significantly enhance a colt’s value if they win. But McEvoy knew he had a filly to challenge them. “I understand the measure of what this race can do for a colt. I certainly get it,” McEvoy said. “But when you’ve got a filly like this, as good as she is, why not run her. “She only had to walk over the road (from her Flemington stable). Widden Stud bred Sunlight and the stud’s proprietor Antony Thompson’s wife Katie is a part-owner in the filly, while Widden is in the ownership of runner-up Zousain. “To breed her is very special,” Thompson said. “We bought her mum (Solar Charged) to go to Zoustar. And to win here is something we’re very proud of. She’s so dear to us. “We would have loved to win with the colt. Zousain is a beauty and he’s going to be a great stallion. He’s very, very good and he’ll get his turn.